From Thung Chang to the international Thailand-Laos border (50 km) there are five minivans a day. 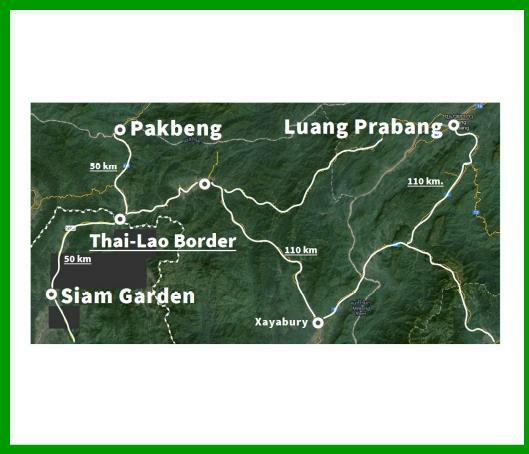 These are the minivans Den Chai-Phrae-Nan-Thung Chang-Huai Kon border. Minivans cannot be booked in advance. The trip takes an hour. From Siam Garden it is also possible to rent a local taxi. Prices for the Laos visa change by nationalities. Normally is about 30-35 dollars. It is possible to pay also in Thai Baht. The tuk-tuk can then bring you to the Muang Ngeun bus station (50 Baht), located about four kilometers from the border. If you have time before catching the bus or if you decide to spend the night in Muang Ngeun, you can change money at the local bank or make a withdrawal at the local ATM box. The bank is located in the center of Muang Ngeun (about three kilometers from the border), next to the market. If you do not have time to change money, no problem. In Laos they are very happy to take also Thai Baht. Normally the exchange rate is fair, even if it is better to change and have Lao Kip. Calculate an exchange rate of about 10.000 Lao Kip for 40 Thai Baht. From Muang Ngeun bus station there are buses to Vientiane, Luang Prabang (220 km), Oudom Xai and Pakbeng (50 km). The bus to Luang Prabang, via Xaignabouli (called also Sainyabuli and Sayaboury), allow you to get also to the famous (and ethical) Elephant Conservation Center, located in Xaignabouli. The bus to Xaignabouli (written Sayabury at the bus station board) leaves at 10:30 a.m. and costs 90.000 Kip. From Pakbeng, you can take the slow boat to Luang Prabang or to Huay Xai, on the Mekong River. The boat Pakbeng-Luang Prabang leaves at 9:30 a.m. and arrives in Luang Prabang at about 5:00 p.m. The boat Pakbeng-Huay Xai leaves at 8:30 a.m. and arrives in Huay Xai at about 5:00 p.m.
Tickets costs 110.000 for both directions. Better to be at the pier at least one hour in advance to buy the tickets. Feel free to contact us if you need more info about the Thailand-Laos Huai Khon-Muang Ngeun border or about norther Laos.